Glimpse from the anniversary concert in Kaunas and interviews with Alexander and Vaidas Kunickis on the TV-show VIP on TV3 Lithuanian. On Friday Alexander Rybak, the winner of the 2009 Eurovision Song Contest, is coming to Lithuania from faraway Qatar, where he gave an impressive performance. In the provisional capital the performer will have a concert and the Norwegian of Belarusian origin also has organised a secret visit in Vilnius, about which he refuses to tell. On September 11th 2013 Alexander Rybak, accompanied by pianist Stefan Zlatanos (Norway) and the Christopher Chamber Orchestra (Lithuania), performed a classical concert in Vilnius Picture Gallery as a closing part of the annual Christopher Summer Festival. The concert has been broadcasted on Lithuanian TV-channel “LRT kultura” on October 12th. During the concert in Vilnius Alexander Rybak was wearing a new vest created by a Lithuanian designer. Found by Ulli C. Translated by Erika Jasiūnienė. English revising by Katie Anderson. Yesterday, September 11th, for the finale of the Christopher Summer Festival concert, appeared Norwegian violinist Alexander Rybak (27). He enjoyed not only our audience, but also the country’s designers. At the concert in the Vilnius Picture Gallery courtyard, Alexander Rybak was wearing a vest created by designer Egidijus Sidaras of the fashion house “Cantas”. The Violin performer confessed to the producers that it is the first case when his favorite part of an outfit – the vest – was created specifically for him by a designer, but after trying on the new vest he also ordered another one. Found and translated by Erika Jasiūnienė. English revision by Anni Jowett. The European charmer Alexander Rybak shies away from the world of entertainment: to become a hostage to money – it is awful. “First and foremost I am a composer, then a violinist and a pop singer”,- the Eurovision star who lives in Norway has said repeatedly. Alexander Rybak’s upcoming concert in Vilnius will make sure of that, because the guest promises to perform violin classics and his own compositions with the St. Christopher Chamber Orchestra, under the baton of Professor Donato Katkaus. Alexander Rybak comes to Lithuania to play classic concert! Found and translated byErika Jasiūnienė. English revision by Katie Anderson. The European charmer changing his image. Alexander Rybak will perform at Christopher Summer Festival in Lithuania! Found and translated by Erika Jasiūnienė. English revision by Katie Anderson. The Concert is organized with the Norwegian Embassy. The soloist, Alexander Rybak (violin, Norway) with the Vilnius City municipality St. Christopher Chamber Orchestra, and conductor Donatas Katkus. At the Christopher summer festival – powerful musical intrigue! The charismatic Alexander Rybak will appear with the St. Christopher Chamber Orchestra, conducted by Donatas Katkus. And how much he compels your attention solely with the violin, you will only find out in this concert! Upload by Sonya Luzina. English translation by Erika Jasiūnienė & Zhanna Sergueeva. English revision by Anni Jowett. Subs by Ulli C.
Videos: Alexander Rybak – radio interviews in Klaipeda, Lithuania, 14.03.2013. Alexander Rybak on the radio “Raduga”, Klaipeda, Lithuania 14.03.2013. A.Rybak arrived in Lithuania and here he has time for both concerts and to go shopping. On Wednesday evening Eurovision winner Alexander Rybak arrived in Lithuania for his five-day tour. The main purpose of the artist was to meet with fans, present his songs and talk with the media. In the first days of his stay, the singer had time to take care of his good looks and wellbeing. On Wednesday the Norwegian singer of Belarusian origin Alexander Rybak arrived in Riga on an aeroplane from Turkey. From Riga he went to Šiauliai with the representative of the concert agency. Here the singer gave an interview to a TV show and performed at a nightclub. Alexander had concerts in four Lithuanian cities – Šiauliai, Klaipėda, Kaunas and Vilnius. Found by Sonya Luzina. Translated by Erika Jasiūnienė. This Sunday, March 17th, at 19.30 direct from TV3 – is the fourth largest-scale musical project “Battle of Choirs” show. In the project six choirs remain – one of them will meet their fate this Sunday. Most of this Sunday’s interest will be on – “Battle of Choirs” guest – the 2009’s Eurovision winner, Alexander Rybak arrives especially from Norway for the TV3 project. Alexander Rybak is going to Lithuania with several concerts! Article about the concert at Soho Club, Vilnius, 15.03.2013. Description: to Lithuania comes charming Norwegian singer and violinist Alexander Rybak, who won a phenomenal victory in the Eurovision Song Contest. The “Fairytale” composer, songwriter and performer who rocked the whole Europe with this song, has even arranged four shows in Lithuania – in the four largest cities of Lithuania, and one of them will be in Vilnius. 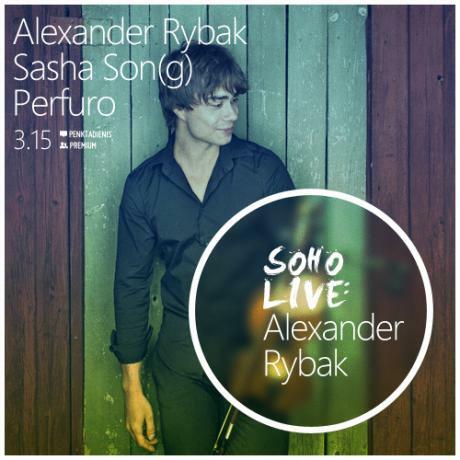 Now on March 15, Alexander Rybak will perform and to arrange impressive musical show in Vilnius club SOHO. Uploaded by Tessa La. English translation by Julia B., Sonya L & Zhanna S.
Two interviews after performance in “Lietuvos Balsas” – Voice of Lithuania. Vilnius April 8th 2012. Interview at stage right after performance of Roll with the wind. Subtitles by Tessa Lande. Croatian translation by Karolina Pavlov. Slovak translation by Danka Čolláková. Russian translation by Zhanna Sergueeva. Interview at the TV-show Lietuvos Balsas. Slovak translation by Danka Čolláková . Croatian translation by Karolina Pavlov‎. German translation by Sabine Fundel. Dutch translation by Marijke Arentsen. Romanian translation by Laura Ser. Russian translation by Zhanna Sergueeva. English translation by Jolanta Esu, English revision by Anni Jowett. In two weeks, returning again to Lithuania and agreeing to perform together with the LNK project “Lithuanian Voice” participants, the charismatic Alexander Rybak says, that he remembers Lithuania and its people perfectly. This time he hopes that he will have more free time to visit the local sights and finally eat a nourishing meal…. “It has long been no secret that after I won the Eurovision Song Contest, my life changed substantially. I’m travelling a crazy amount, I have a lot concerts and I have no time for myself, but I tried very hard, and finally I managed to see the positive sides of this pace of life – I found a soul mate. My relationship with her is ideal, because .. we rarely see each other. When I come home and we meet, we are just too attracted to one another, to be looking for something to get angry about. So we keep good relations”,- the performer known not only in Europe revealed to Delfi over the phone the secret of a happy relationship.